The famous Benguet Road, better known far and wide as Kennon Road, is one of the best mountain roads in the world. Named after Major Lyman M. Kennon, the ultimate builder of the road, it stands as a tribute to Major Kennon's engineering skill and knowledge and excellent understanding of human nature. The construction of the historic road was difficult and dangerous. Diseases and even cholera attacked the workers. Some of the nationalities who contributed to the labor force in the construction of the highway were Filipinos, Spaniards, Indians, Chinese, Japanese, Hawaiians, Portuguese, Mexicans, Italians, French, English, Canadians, Germans, Americans, etc. The largest contingent of foreign workers recruited to construct the Kennon Road in 1903 were the Japanese. Based on the 1903 census, there were 921 Japanese migrants. Of these, there were 800 Japanese workers from Okinawa Prefecture. They were among the more than 20 nationalities of workers who worked in the Kennon Road Project under the supervision of Colonel Lyman Kennon. Of the original 800 workers, only about 300 survived when the road was completed in 1907. The rest fell victims to accidents and diseases. 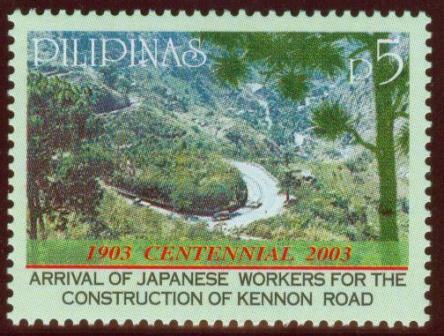 2003 celebrates not only the 100th anniversary of the role and historical significance of the arrival of the first group of Japanese workers who worked in the construction of the historic Kennon Road, but also a celebration of the human spirit among peoples of different nations that brought about the construction of the road.